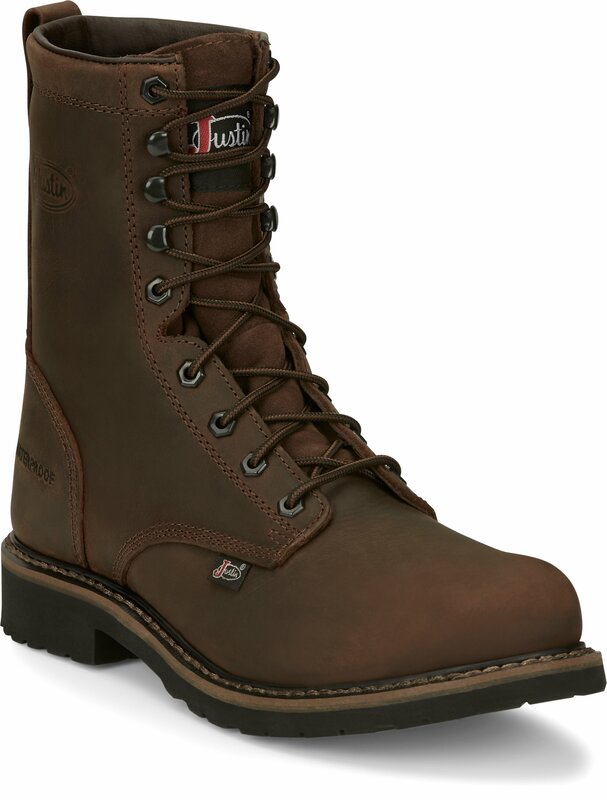 Ready for the job, the Drywall Waterproof Steel Toe 8, is an 8-inch tall Men's work boot with a distressed beige waterproof leather exterior. 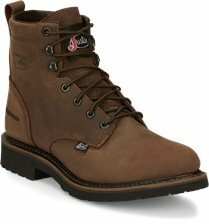 The steel toe provides armor-like protection and it's built for comfort with the J-Flex Flexible Comfort System® that offers lasting support throughout the day and the Worker II rubber outsole is crafted for performance allowing you to have power and stability on various surfaces in the work field. 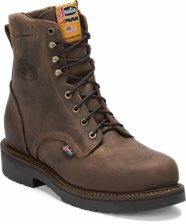 It's also an ASTM electrical hazard rated boot that guarantees protection from open electrical currents up to 18,000 volts. Boots are way to long for being 11.5d. They are probably the most uncomfortable boots I’ve ever worn. Great boot at a great price! 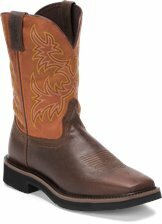 I have just ordered two more pairs of these boots which will make 12 pairs in all of Justin brand boots I own. If you've never tried on a pair of Justin work boots, you owe it to yourself to do so. They're pure comfort! I'm a pipe-fitter who works in the field repairing natural gas pipelines and it requires lots of shovel work. These soles are perfect as the arch shank provides great support when driving a shovel into hard soil as well as the non-agressive tread making for easy cleaning in muddy conditions, unlike a logger style. They're lite-weight as well, making them an overall good work boot with style. They look good enough to wear for dress, thus the reason for ordering the two pairs. P.S. let's not forget, they're made in the USA!!! best work boot ever ! i bought a pair of the wk961wyoming weather proof work boots back in 11/24/2012 ive worn them every day since, just now the bottoms wore through ,no leather damage at all ,i wouldnt think of buying another brand i have the orginal box and receipt ..